For years, beginning in the 1990s, aggressive enforcement of minor offenses, like riding a bike on a sidewalk or drinking in public, was a fundamental part of policing in New York. But one of the lasting consequences of that enforcement has become a major policy dilemma, as more and more people lived with the threat of jail time for long-ago, low-level charges. On Wednesday, in a sweeping coda to those policing practices, more than half a million outstanding warrants for minor charges dating back at least 10 years were dismissed in a coordinated effort by New York prosecutors to ease the enduring effects of that era. The district attorneys for Brooklyn, the Bronx, Manhattan and Queens collectively moved to dismiss about 644,000 warrants, the latest in a string of actions to reduce the number of people passing through the criminal courts and city jails on charges that would otherwise merit little more than a fine or community service. The Police Department, in the face of a federal lawsuit, has greatly scaled back its practice of stopping and searching people in high-crime neighborhoods. The police and the district attorneys have reduced the number of people prosecuted on minor marijuana charges; the City Council passed a law last year creating civil tickets for minor offenses that used to lead to criminal summonses; and in June, the Manhattan district attorney’s office announced it would no longer prosecute most people arrested on fare-beating charges. Cyrus R. Vance Jr. (pictured above), the Manhattan district attorney, said in court on Wednesday that the outstanding warrants had driven apart the police and the communities they serve and created unnecessary obstacles for people seeking jobs and apartments. Judge Amaker assented to the motion brought by Mr. Vance, dismissing 240,472 Manhattan warrants. Similar scenes played out in courthouses in Brooklyn, Queens and the Bronx. 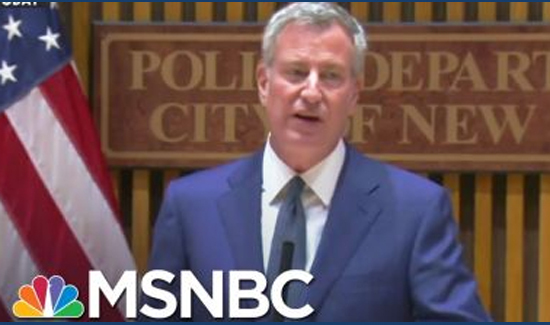 The picture is of the one man wrecking ball Comrade DeBlasio, not Cyrus Vance as stated.